October 21, 2018 - by John Yunker - 2 Comments. I tried to follow the directions. Perhaps I didn’t use the right sized skillet. Perhaps I misinterpreted what “lightly oiled” meant. I don’t know. The directions said to cook two minutes per side or until the desired crispness. Only I never managed to achieve any degree of crispness. I gave up after five minutes per side. 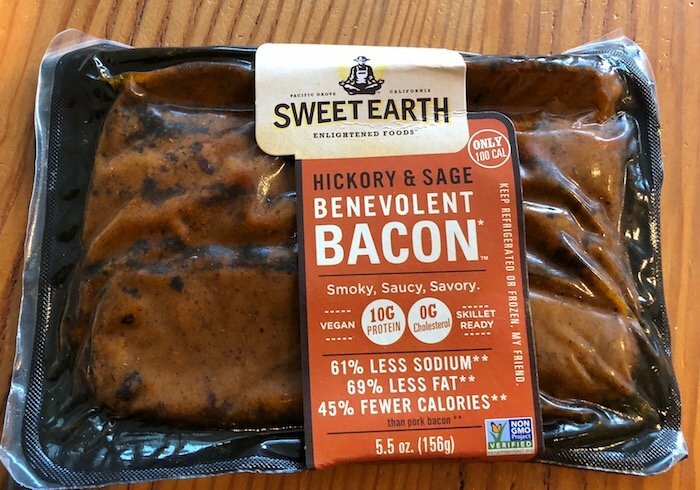 The flavor is perfectly fine — it has a decent smokiness to it — but the bacon itself was crumbly and, well, just not crispy. It worked fine on a sandwich for flavor only, not so much for texture. So I’m sad to say I can’t recommend this fakin’ bacon. John Yunker is a novelist, playwright, web globalization geek, and co-founder of Ashland Creek Press. Learn more at www.JohnYunker.com. Well, none of the vegan bacons similar to this one are actually crisp so I use them mostly for the flavor, which I think is pretty good. I’ve always wondered why the directions reference crispness also. For crispness I find that coconut bacon is the best . Thanks Pat. I’ll look into other brands… yes, very odd about the ‘crispness’ promises.